I am a huge salad freak. I love all kinds if you haven’t guessed by now. I really enjoy the simplicity of this easy tomato summer salad. You can make it with just a few ingredients. You may already have them all in your pantry. This tomato summer would be great for any summer party. It fits any diet since it’s vegan, gluten free and paleo. If you wanted to stretch it out, you can always serve it with quinoa as well. If you love salads too, you may love my post on 18 Quick and Healthy Salad Ideas or my Healthy Salad Dressing Recipes post. It literally takes a few minutes to make this. I personally think it tastes even better after about 30 minutes. Once the flavors have time to marinate. I hope you enjoy this as much as we did. We shot a short video for this recipe. You can view it below. For more healthy recipe videos, you can subscribe to my You Tube channel. Super easy salad perfect for parties. You can serve right away, or you an let it sit about 30 minutes to marinate. This salad should last about 4 days in the fridge. Yummy, I love summer salads! It's amazing how beautiful and colorful vegetables are but they are so nutritious, too! Thanks for the recipe. 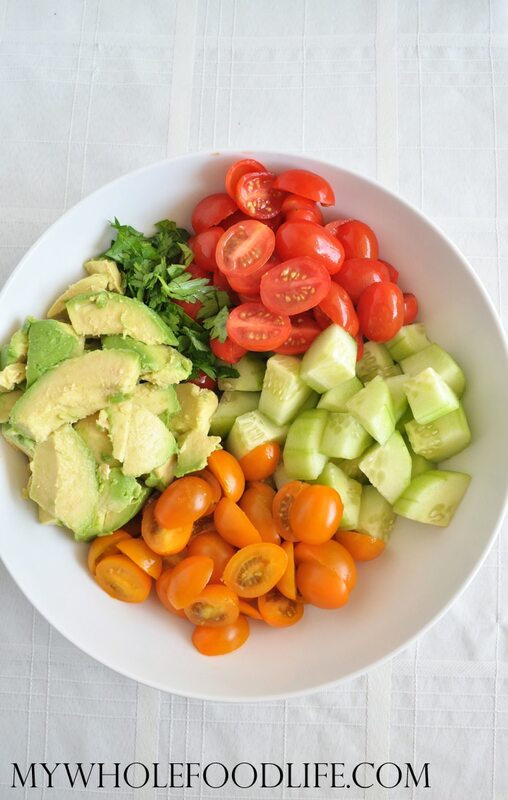 Yummy, love this and super simple to put together. Thank you for sharing this. I tried this today....delicious. I threw in a little red onion, and fresh dill. Thanks for sharing your recipe! I will definitely try it this week.